Spike is not the only bulldog on campus these days. Anyone passing through the mall in recent weeks has probably noticed the new bronze bulldog sculpture on the library patio. Through generous gifts from alumni and friends, the artwork was commissioned with Crandall Sculpture and Design. The artist, Brandon Crandall, of Brashear, Mo., worked to create a piece of art that would be both visually stunning and create pride for every generation of bulldogs. The nearly six-month project included art sketches, feedback from a bulldog breeder and Crandall’s signature process of building sculpture with foam, clay and countless hours of design before the mold was built and sent to the foundry for bronzing and completion. 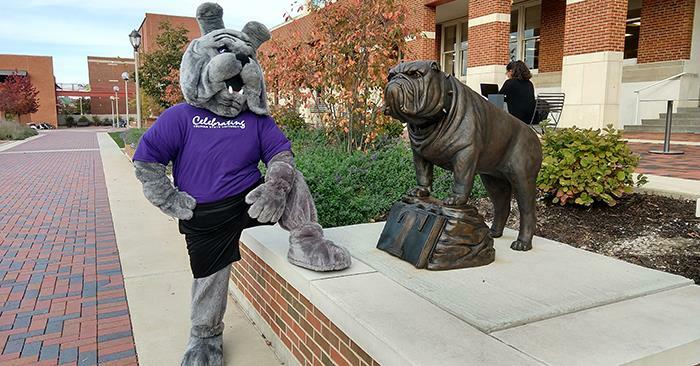 After a quick turnaround from Eligius Bronze of Kansas City, Mo., the finished bulldog was installed in time for Homecoming 2018 and was unveiled during the dedication of the Roger J. Johnson Patio. The space was named in honor of Johnson, a longtime employee who retired from the Physical Plant in 2017 after 29 years of service.